The words for baking soda, baking powder, and yeast. These had evaded me for nearly a month until I discovered that they are not kept in the flour & sugar isle, but rather on the spice rack, in tiny foil packets that can’t possibly hold more than two tablespoons. But I made soda bread over the weekend and it was delightful. Frozen vegetables. I was going insane for lack of greenery until I discovered that while the fresh vegetables consist of white cabbage, a handful of pepper types, and sad tomatoes, the frozen isle is a riot of exciting, perfectly fresh-tasting fruits and vegetables. Favorites: a mix of raspberries, blackberries, sour cherries and currents called erdei gyümölcsök, lit. ‘forest fruits’, a mix of corn, peas, carrots, wax beans, and bell peppers called ‘mexican salad’, and cubes of frozen sorrel and spinach. Sorrel grows as well as cabbage here and is believed to be a cure for everything, unsurprising, given its vitamin C content. I still miss chard and kale more than anything. Sigh. The ready-made food section. Fresh gnocchi vacuum-packed in plastic bags became pan-fried gnocchi with bacon, onions, and peas. 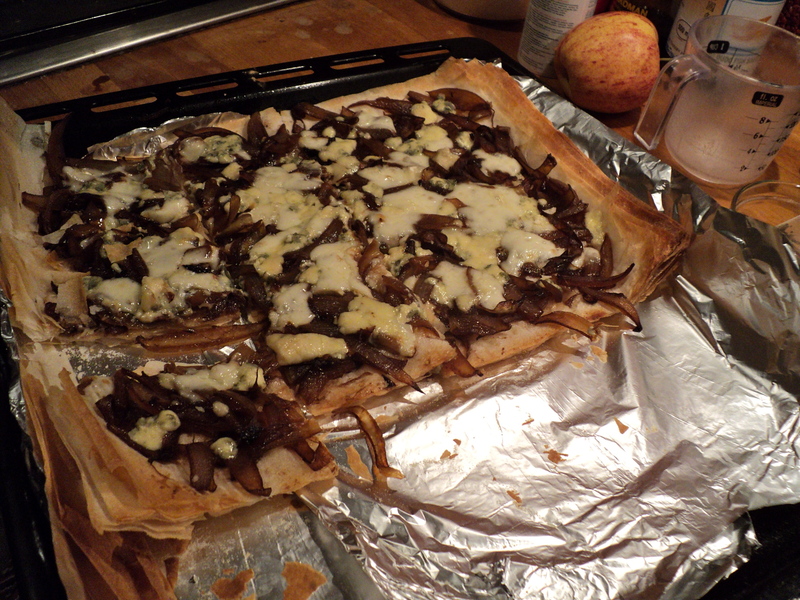 Packaged strudel dough, intended for Hungarian apple strudel, provided the ideal base for a caramelized onion tart with Gorgonzola and brie. 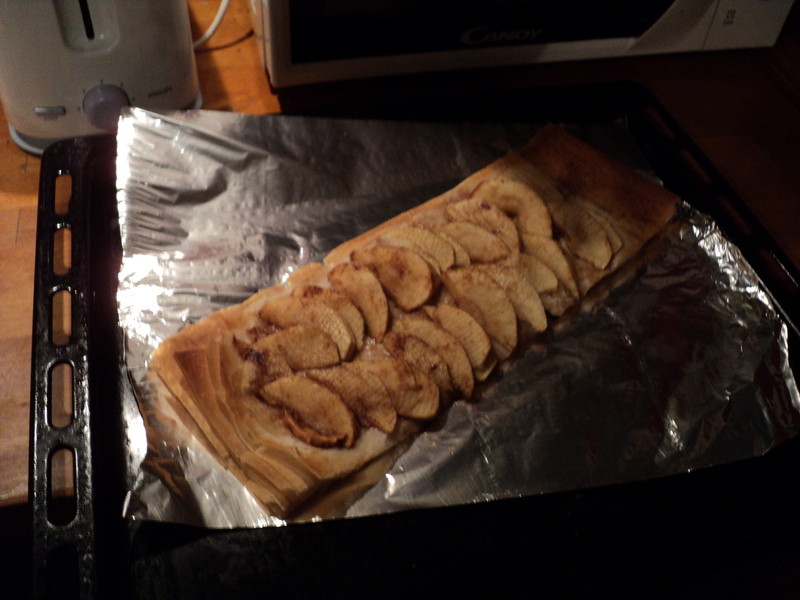 Actually, there was so much strudel dough that we cut off a third of it, tossed some thinly-sliced apples with sugar and cinnamon à la Tara Contractor and made a really simple, awesome apple tart for dessert. Yesterday I went for a long roundabout walk after school, ending up at Auguszt Cukrászda in the center of Pest. Auguszt is one of the oldest confectionaries in the city, dating at least to the 1880s. They specialize in Hungarian desserts, especially sponge cakes and krémes (think two layers of pastry sandwiching a thick egg custard). Happy to get indoors, I ordered a coffee and two macarons, and spent the next hour eating and generally being happy to live in such an excellent city. It’s supposed to be up to 3°C today, the warmest it’s been for nearly two weeks, but right now the air is thick with blowing snow, so I’m not sure if Wunderground is lying to me or not. I don’t really mind the snow–it does make everything pretty. The Danube is still flowing, but it’s thick with chunks of ice and quite low. I understand that the shipping channels downriver were closed due to ice. Winter! It’s crazy. Claremont kids, you don’t know how good you’ve got it. Do update us on your heating situation! I am enjoying your cooking adventures but in the back of my mind I can’t help but wonder if you’re able to see your breath while making these fabulous concoctions. I’m actually doing much better! My landlady brought me a space heater that I can use during the day, which makes everything so much warmer. Hopefully someone will come to fix the gas next week, but it’s already getting warmer out (over 3°C today! yay!) so it probably won’t be as big of a problem as it was. Food blogs rock! Will try your linked recipes soon! Here in winter, almost nothing grows on the fields, only in greenhouses. So if you want some “fresh” vegetables, they can be found in bigger marketplaces (or crappy imports in big stores), but they are not even close to the real fresh ones from spring to autumn. Just like the sad tomatoes you’ve mentioned, at this time they are usually imports from mediterranean countries like Spain. That sounds delicious! I hope to visit one of the farmer’s markets in Buda next week, so I will look for the bear onions and report back.